Human BTN3A3, His Tag (BT3-H52H0) is expressed from human 293 cells (HEK293). It contains AA Gln 30 - Trp 248 (Accession # AAH15815). The protein has a calculated MW of 25.5 kDa. The protein migrates as 28 kDa under reducing (R) condition (SDS-PAGE) due to glycosylation. Human BTN3A3, His Tag on SDS-PAGE under reducing (R) condition. The gel was stained overnight with Coomassie Blue. The purity of the protein is greater than 95%. 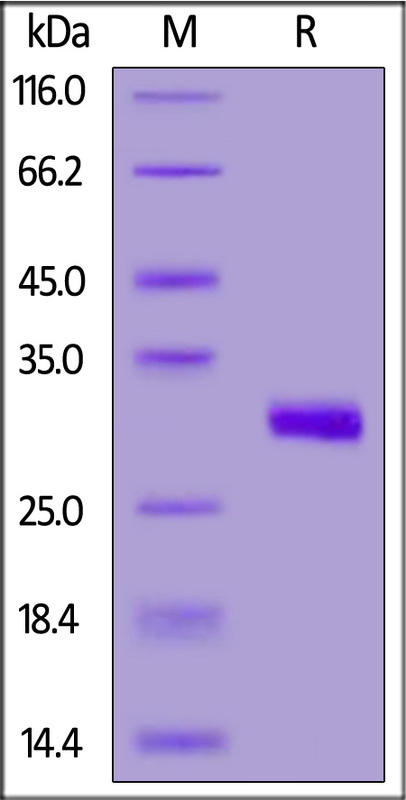 Butyrophilin subfamily 3 member A3 (BTN3A3),a member of the immunoglobulin superfamily and BTN/MOG family, is also known as BTF3, which contains one B30.2/SPRY domain and two Ig-like V-type (immunoglobulin-like) domains. BTN3A3 is detected in peripheral blood mononuclear cells ,T-cells ,spleen and lymphocytes. BTN3A3 also plays a role in T-cell responses in the adaptive immune response. Stimulation of human butyrophilin 3(BTN3) molecules results in negative regulation of cellular immunity. (1) Yamashiro H., et al., 2010, J. Leukoc. Biol. 88:757-767. (2) Palakodeti A., et al., 2012, J. Biol. Chem. 287:32780-32790.